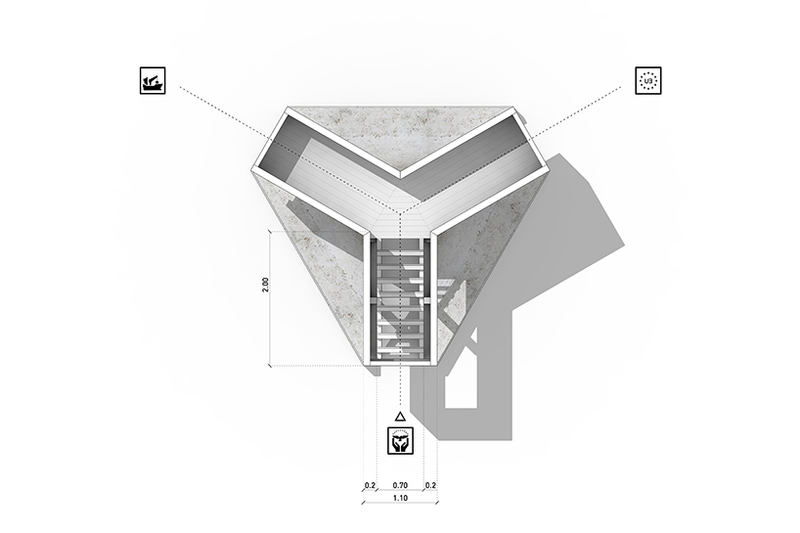 nuno pimenta is a trans-disciplinary design studio based in portgual, bringing together the worlds of art and architecture. 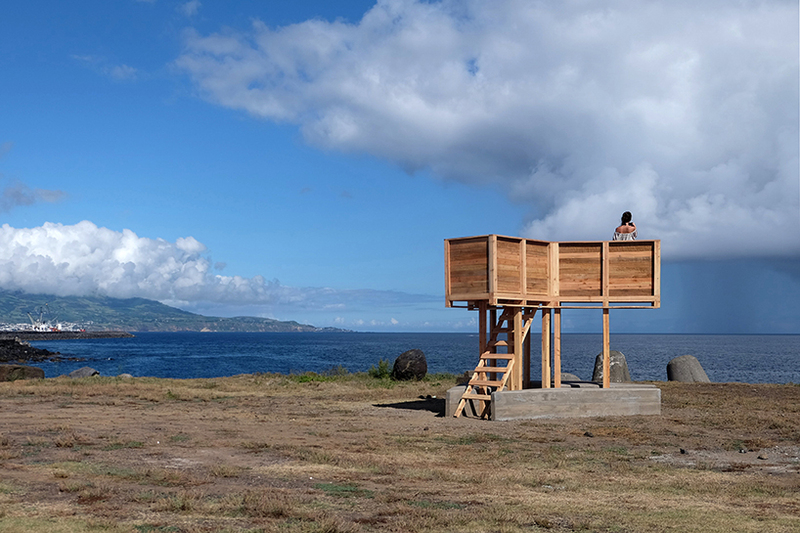 in portugal, the azores archipelago is partly defined by the continuous search for new horizons, juggling between economic sustainability and the feeling of enclosure. 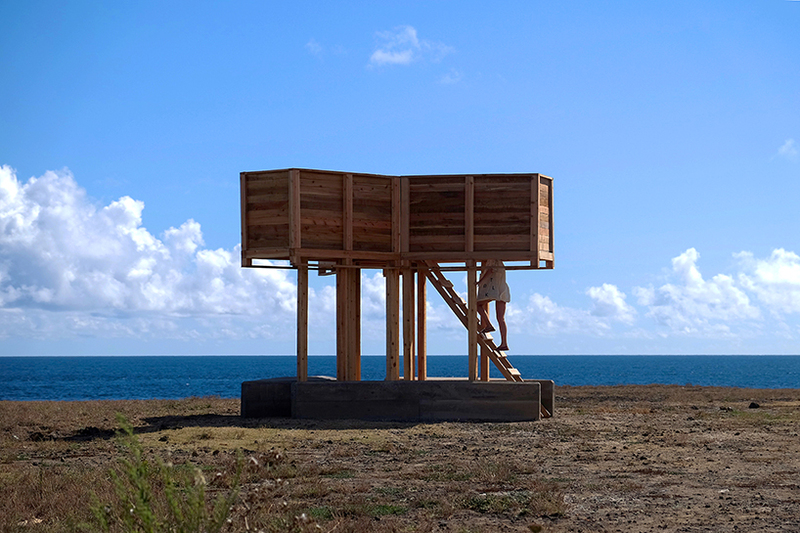 following this idea, portuguese based nuno pimenta creates the two manifolds viewpoint — an artwork that explores the ‘dual’ relationship between the permanent and temporary, the act of going or staying. 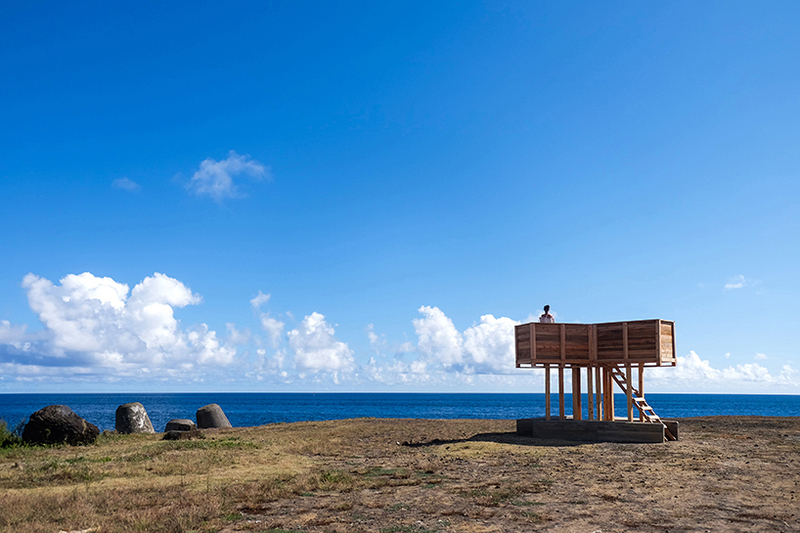 as expressed by the studio, ‘it invokes the desire to raise ourselves to be able to see a little more of this seemingly infinite horizon, this diffuse but concrete line that defines an uncertain periphery’. 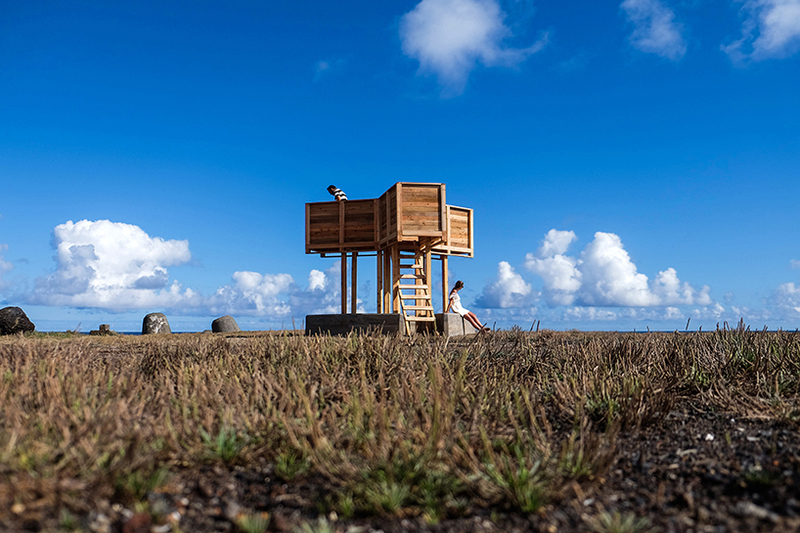 the viewpoint is located in santa clara, one of the most peripheral places of ponta delgada. although an underprivileged area, santa clara is known for its importance in the construction of the city port — one of the major exchange gates between the archipelago and the rest of the world. 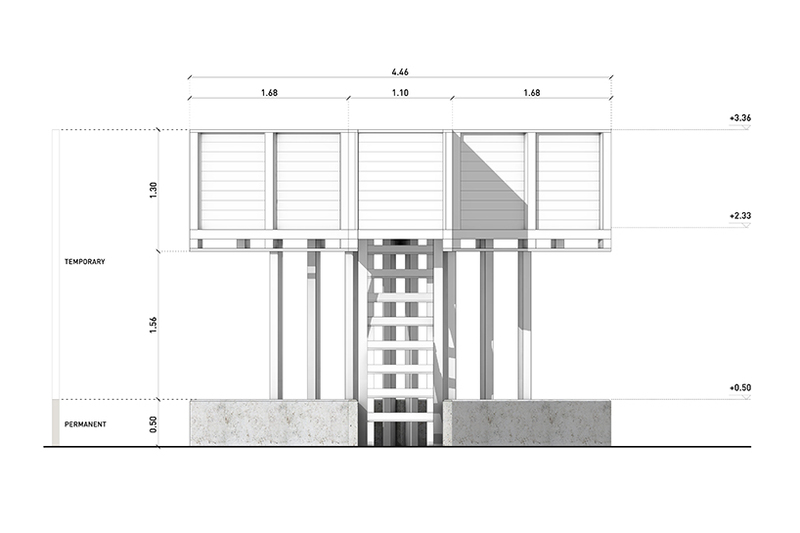 according to nuno pimenta, it was important to create a new centrality that emphasizes the urban periphery of the region. 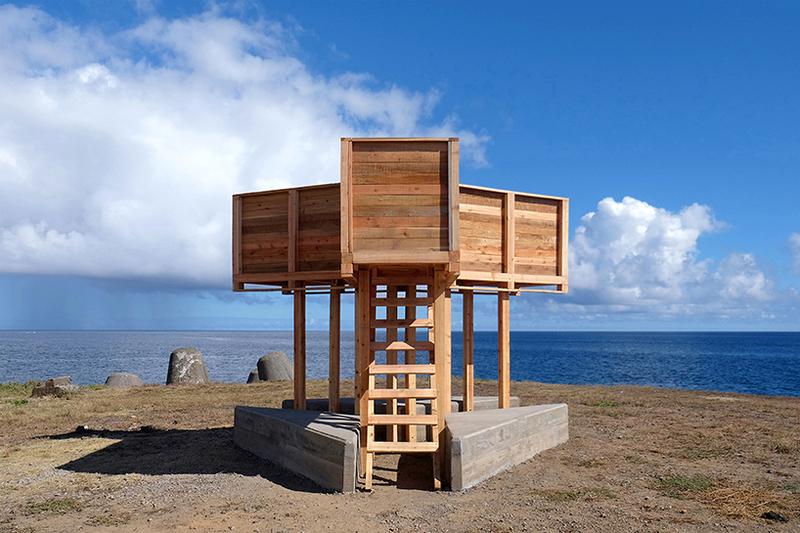 therefore, two manifolds becomes a landmark, a stopover and observation point that connects the site to the political and geographical contexts of azores. 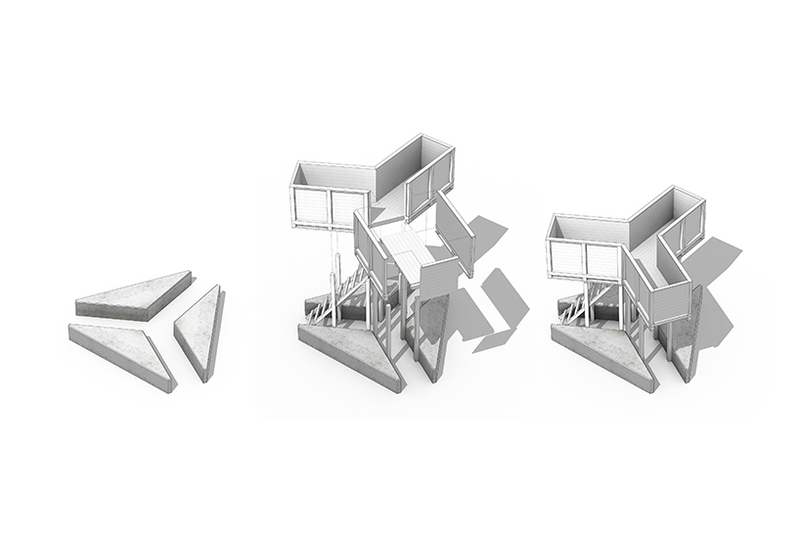 the installation is composed of two levels — a low point reserved for rest and stay, a higher one for observation and introspection– and oriented in three different directions to highlight the various degrees of proximity to the site. 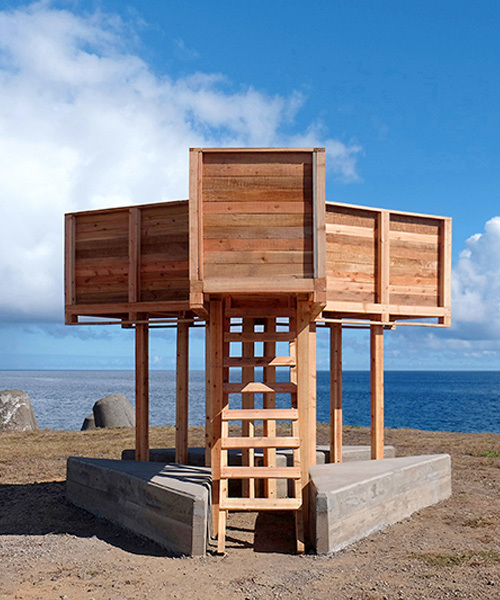 each level is made of distinct materials with different resistances to time; they were all built through processes of auto-construction and in collaboration with local artisans and volunteers. 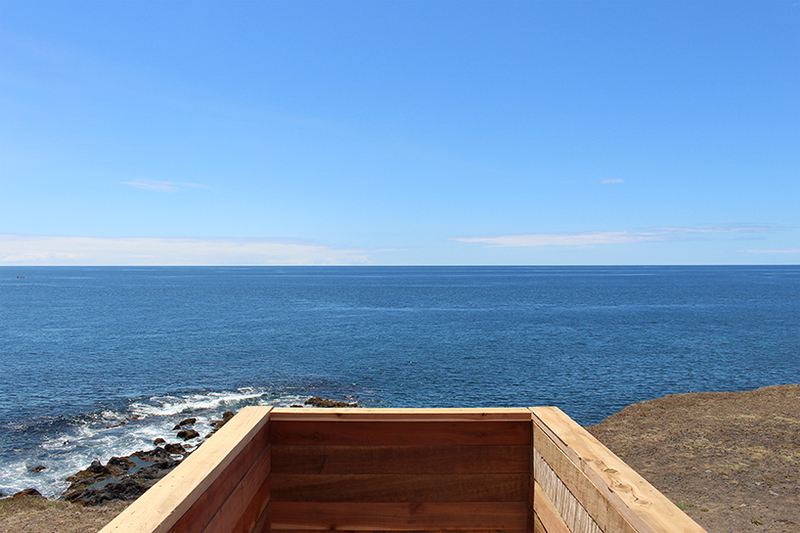 taking into account the location — an inhospitable area exposed to the sea and winds — the lower level has a set of three concrete benches, like tetrapods that protect the area from the waters. 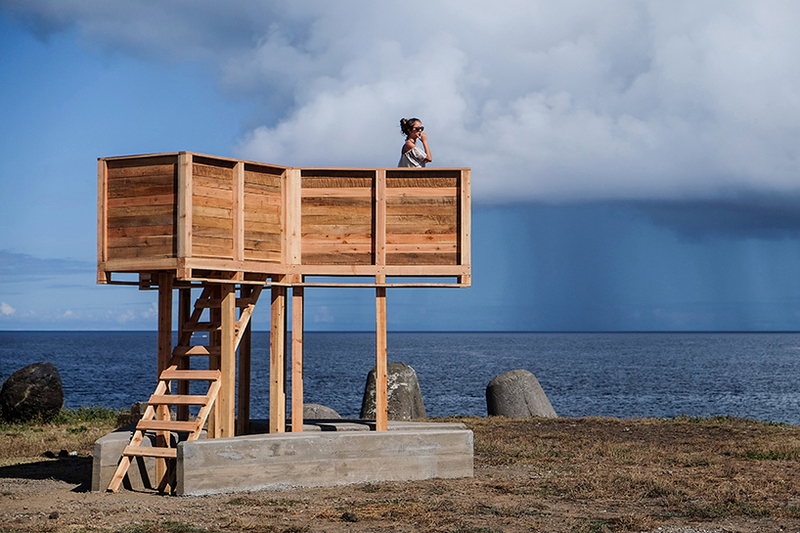 ‘these benches suggest a new centrality and, due to its permanent character, record the intentions of the piece in case severe storms affect the place’, explains nuno pimenta. 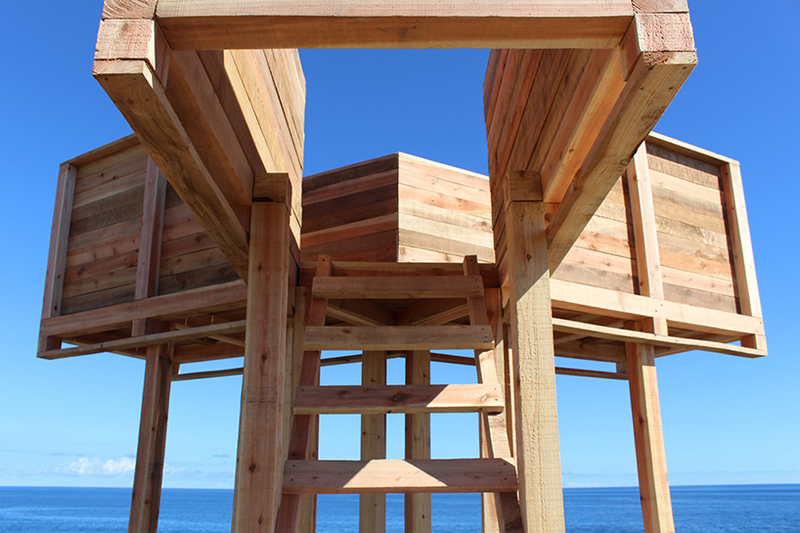 the top level is in cryptomeria wood which has temporary characteristics and is easy to disassemble for storage and maintenance purposes. 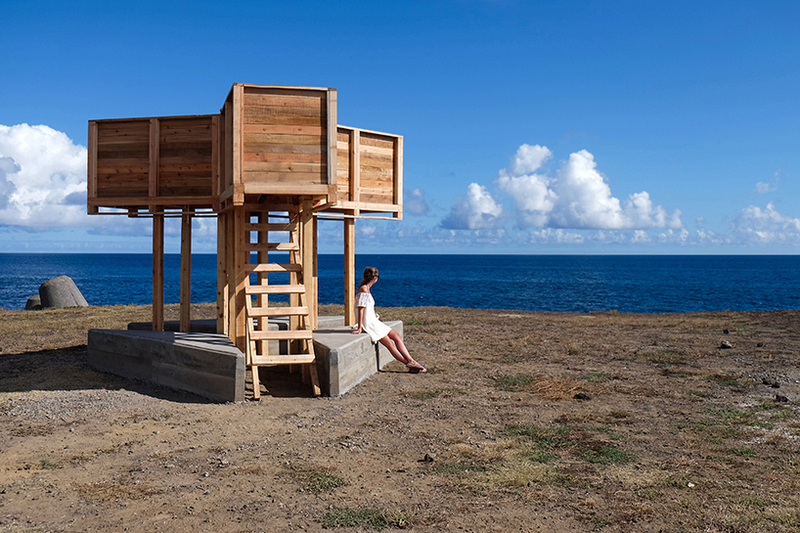 as mentioned, this tripartite wooden box points at three directions: the first one, where the entrance is, points to santa clara and invites its residents to visit the viewpoint; a second, swung seaward, overlooks the port of ponta delgada which is the point of entry and exit of the island; the third leads to the opposite direction of the european political centre and reminds people of the ultra-peripheral conditions of the azorean archipelago — encouraging users to extend the context with their own eyes.